Do you watch the birds? For some, it's almost a way of life. My friend hangs a feeder from the tree branch outside of her window. She attracts the birds, day after day, all year long, by the dozen. They perform antics and she benefits. "I like the way they jockey for position!" she said. Hummingbirds are among the smallest. I had a chance to learn from a much larger bird: a heron. My wife and I live in Bethany, Oregon, about a block from from Bronson Creek. Map below. Map courtesy of Tualatin Hills Park and Rec. District. See the ponds and the blue line crossing the map from NE to SW? The blue line's the creek and the ponds are part of the low-lying wetland. Lots of critters live there in the wetland : ducks, coyotes, and herons. My home lies to the right (i.e., to the east) of the "DR" in "NW Aberdeen DR", a block from the wetlands of Bronson Creek. You love it, don't you? I sure hope so. We've all seen pictures of storks on houses in Holland. 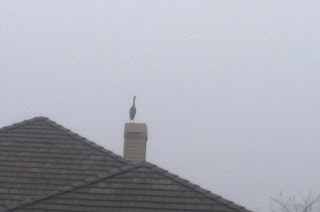 But here's a bird just as large on a chimney right across the street in Portland, Oregon! A once in a lifetime thing for me. As I watched, the bird cocked its head this way, then that. Then this way, then that. Again and again. What do you think brought the bird from Bronson Creek (which is where it'd normally be) up to Aberdeen Drive? I myself think the bird wanted to improve its point of view for some reason. Even a bird as large as a heron must be on guard--look out for enemies like an eagle for example. Maybe something moving in the sky. Possibly a coyote something sneaking through the grasses in the creek bed. Something worried the huge heron. It wanted a better point of view. Why not from a high point, like a chimney a block from the creek? Take a step further. Think of yourself now. We're in difficult, worrisome times. Every day we learn this if we watch television or read the news. In difficult times we worry about how to survive. Imagine that you're living down in the swamp. You want a better perch for the times. Where can you find such a vantage point? A lot of people are discovering a vantage point in the wisdom of the ages. The Bible is a recording of wisdom of the ages, and there are a few other such sources. Specifically, consider this from the book of Isaiah: "The Lord shall renew their strength, they shall mount up with wings like eagles, the shall run and not be weary, they shall walk and not faint." Isaiah 40: 30-31. Well, as a retired Humanities and ethics professor I'd say: learn from the heron. Get to a higher vantage point. To a high place to a better point of view. Copy the wise old bird I saw. Fly high. See better. Then fly off and tend to your business in life, having this new point of view. Where is, and what is, your perch? Worth giving it a little thought.